The College of Environmental Science and Forestry (ESF) will award 182 degrees, including 32 master's degrees and 16 Doctor of Philosophy degrees, during the 2018 December Commencement 2 p.m. Dec. 7 at Hendricks Chapel. 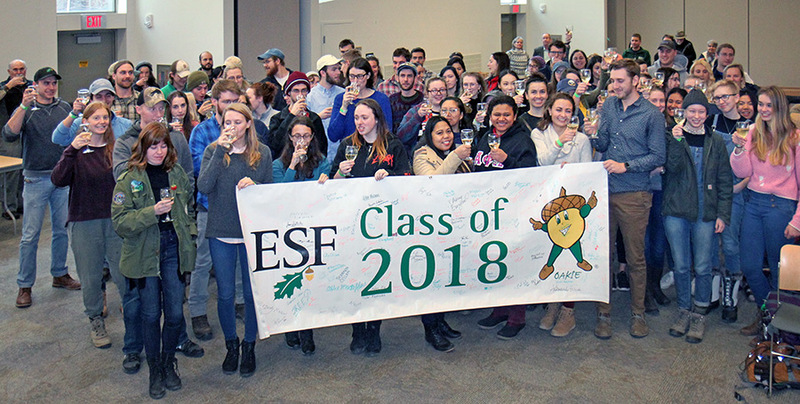 The graduates' accomplishments were celebrated this week with the traditional champagne toast sponsored by the ESF Alumni Association. Three ESF alumni will also be honored during commencement. Graduate of Distinction Awards will be bestowed upon Dr. Robert I. Bruck '78, Dr. Katia R. Aviles-Vazquez '99 and Seth Jensen '05. Isabelle R. Horvath is the student speaker for graduation. She is graduating with a Bachelor of Science in environmental resources engineering. Horvath, of Spencerport, New York, fell in love with ESF when she was greeted by a musk ox on her first visit. She was president of the Environmental Resources Engineering Club, a student ambassador, a member of the New York Water Environment Association and an orientation leader. She was also a teaching assistant, tutor, published undergraduate researcher and mentor. Following graduation, Horvath will begin a research assistant position at Marquette University, where she will study nutrient retention in green infrastructure while working toward a graduate degree in water resources engineering. Student marshals for commencement are Julia-Beth Taft and Kory A. Whittum. Taft, of Greene, New York, is an environmental science major with a minor in applied statistics. She has been involved in AXS Honor Society and the Undergraduate Student Association, serving as a class senator. She was a teaching assistant for Introduction to Soils and an intern at the United States Department of Agriculture - Natural Resources Conservation Service State Office in Syracuse. Taft is interested in continuing her education and developing her skills in watershed and marine science as well as soil science. Whittum, of Webster, New York, is an environmental biology major with a minor in water resources. He served as a teaching assistant for several classes, including Dendrology, Chemistry, and Natural Resources in American History. Whittum was a service track coordinator supporting Carpenter's Brook Fish Hatchery and led weekly volunteer service trips during spring semesters. He played on the ESF golf team for four years while maintaining Academic All-American status and was co-captain his junior year. He participated in internships with the New York State Department of Environmental Conservation and plans to obtain a master's degree in aquatic and fisheries science. The ESF Alumni Association will honor Bruck with the Graduate of Distinction Lifetime Achievement Award. Bruck's career in academia has allowed him to share his knowledge and passion with the next generations of forestry and environmental science leaders. Bruck earned degrees from SUNY Buffalo and ESF, and was a post-doctoral fellow at Cornell University. He taught at North Carolina State University for more than 30 years and attained the rank of Distinguished Professor. He received North Carolina's highest award, the North Carolina Award for Science, and his research on the effect of atmospheric deposition on Southern Appalachian ecosystems is recognized worldwide. Currently dean for STEM programs at Louisburg College, Bruck develops STEM education programs for disadvantaged and minority high school and college students. Aviles-Vazquez is the recipient of the Graduate of Distinction - Notable Achievement Award. She uses her environmental studies degree to address the environmental issues impacting her homeland of Puerto Rico. Aviles-Vazquez was responsible for compliance and community participation of the ecological restoration of the Cano and the San Juan Bay Estuary. In 2016, she set up the Model Forest Office and established the Model Forest Trust to help with landscape conservation and sustainable development strategies. Since Hurricane Maria, she has concentrated her efforts on improving human and ecosystems health, securing more than $300,000 for relief efforts. Currently, Aviles-Vazquez is director of the first Karst Research Institute in the Caribbean and is co-drafting the agricultural section of the Puerto Rico Climate Change Council's State of Climate. The Graduate of Distinction - Incipiens Quercu (young oak) Award will be presented to Jensen. The award is given to a recent ESF graduate who exemplifies ESF's commitment to environmental stewardship. Jensen, a graduate in environmental resources engineering, has served the city of Auburn, New York, as an engineer for nearly a decade. He was instrumental in managing the city's LED streetlight installation, saving almost 800,000 kilowatt hours annually. He was also able to repower a dormant hydro-electric facility and rehab a second facility. Currently director of municipal utilities, he is leading Auburn's evaluation and treatment of emerging blue-green algal blooms, a microcystin toxin, in the city's drinking water. His implementation of an activated carbon system to remedy this issue has resulted in more than $2 million in grants for Auburn and the town of Owasco. Following commencement, a reception will be held in ESF's Gateway Conference Center from 3:30 to 4:30 p.m.